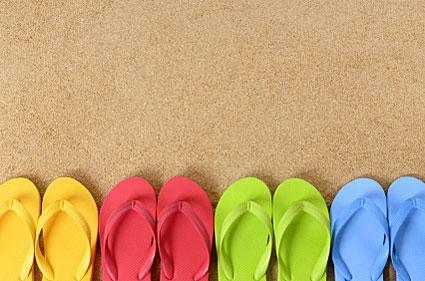 Whether you're planning a big event or stocking your store, you may find yourself in search of bulk flip flops. Fortunately, the Internet is rife with wholesalers that carry stylish and affordable selections of this comfortable shoe. If you've ever planned a big party, you've probably purchased hundreds of paper plates, spoons, favors or other supplies in mass quantities. Store owners operate in a similar way. In order to cater to their clients, they purchase merchandise in bulk from wholesalers. Other individuals who may buy bulk include brides planning large wedding parties and companies planning major marketing events. College students may also purchase items in bulk for fundraisers, raffles or fraternity, sorority or campus events. Wholesalers are the first place to turn when you're purchasing anything in bulk. Though you may have a preconceived notion that wholesale selections are bland and basic, this couldn't be further from the truth. Thanks to the great many online wholesalers catering to the ever-growing market of boutiques - both brick and mortar and Internet - the selection of flip flops and other types of footwear is immense. Perhaps more importantly, you'll find genuinely stylish shoes in bulk selections. The "something for everyone" mentality definitely applies at ShoeNet.com, where bulk footwear is available in an almost overwhelming variety of styles. This is particularly attractive if you're a store owner looking to purchase bulk items at reasonable prices. ShoeNet's merchandise is competitively priced, and all items are priced per pair (as opposed to per case). When summer rolls around, you may want to add these cheerful flower-kissed thong sandals to your inventory. Available in two colors, they're bound to be a beachgoer's favorite. Get comfy with these unusual massaging flip flops. They'll give your customers something new to love - with every step they take, their soles are gently massaged by the textured foot beds. Appeal to their trendy sides with these suede thong sandals. A sturdy wedge heel, smooth suede material and glitzy metallic straps lend these flip flops a feminine, sophisticated touch. This is the place for the basics and then some: You'll find quite an enormous selection at DollarDays.com, a wholesale company that specializes in providing small businesses with high-quality merchandise at affordable prices. This is but a small taste of the many styles available. An array of basic flip flops in assorted colors are packaged in polybags with a hanger. These sensible shoes are ideal for people of all ages and shoe sizes. These playful printed flip flops add a vibrant touch to women's outfits. In several colors, each is embellished with a bright star print. Kids who love the sponge who lives in a pineapple under the sea will dig these Spongebob Squarepants flip flops. Two different styles are available in various sizes. Individuals planning major events may want to offer personalized marketing materials to clients. In that case, flip flops imprinted with the company's name are available at Cariris Flip Flops, a company that manufactures high-quality rubber flip flops. Get customized! A small label can be affixed to the strap or back of the flip flops, or the foot bed and strap can be imprinted with the label. Note that it can take up to 60 days for your customized flip flops to arrive, so plan accordingly. Minimum orders are 3000 pairs. The company also offers basic wholesale flip flops, like these wedge styles. In nearly every color you can imagine, there's something for everyone. If you need a handful of flip flops but not necessarily hundreds or thousands, you can easily pick up a few pairs at inexpensive retailers like Old Navy, Walmart or Target. The benefit is that you can hand pick the colors yourself, whereas many wholesalers sell their flip flops in a package that contains many colors and sizes. If you're just placing a small order, you probably won't have use for every single piece in the package. Purchasing the flip flops at a brick and mortar store is helpful if you only need a few pairs. Another option when purchasing bulk flip flops is the Oriental Trading Company, which carries several styles in various sizes. Buying a large supply of summer's favorite footwear doesn't have to be daunting. Shop around, and by keeping these tips in mind, you'll find the best products for your budget. Quality counts. Although it can be tempting to purchase the lowest-priced flip flops, consider whether the quality of the shoes meets your needs. Very cheap pairs may have thinner soles, and the mid-section that secures the foot may not be attached well. If you are purchasing flip flops to decorate and resell or to stock a store or sell at an event, consider the level of quality you want to provide according to your budget. Be careful of single-use styles. Extremely cheap prices may be on flip flops designed for pedicures or single-use products. Unless this is your intent, watch to make sure you are not accidentally purchasing a single-use flip flop when you intend to purchase a standard version in bulk. Consider seasonal sales. If you can get away with having different styles of flip flops, get a little creative and consider shopping end-of-season sales to meet your needs. Discount and even standard retailers are often eager to get rid of their summer shoe stock by the time early fall hits, and you can get good quality at a low price. Use your warehouse advatange. If you are an individual or small-business owner who belongs to a warehouse club, shop the club for potential discounts. Since the clubs offer clothing and shoe items, flip flops may be available. Since the warehouse can pass their savings on to members or may have in-house brands, you can find a surprisingly good deal. There are a number of reasons for buying flip flops in large quantities. Whether you're using them as wedding or party favors, for group events or fundraising, or as a staple for your business, this footwear selection is one that never goes out of style.